I am a firm believer that every home cook needs an armory of side dish recipes to serve that are healthy, colorful, and yummy! Your family will not even know that their meal was so simple to make if you take care to keep the side dishes attractive while using simple, fresh ingredients. 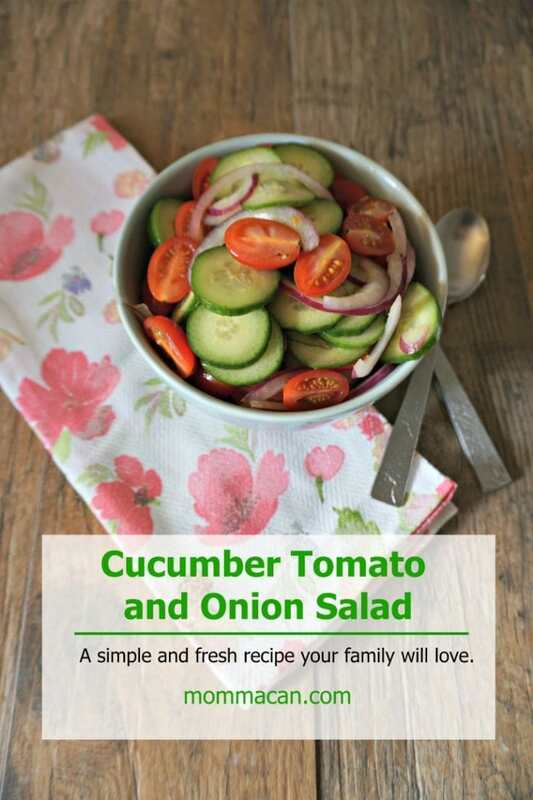 This fresh cucumber, tomato, and onion salad is a perfect example of adding color, fresh, crisp vegetables and a yummy, simple dressing that is not so overdone that even the picky eaters might give it a try! Cucumbers were my favorite vegetable as a child. They were green, but not so green that I would turn my nose up and frown. I remember picking cucumbers out of my grandma’s garden and eating them with table salt, it was delicious. 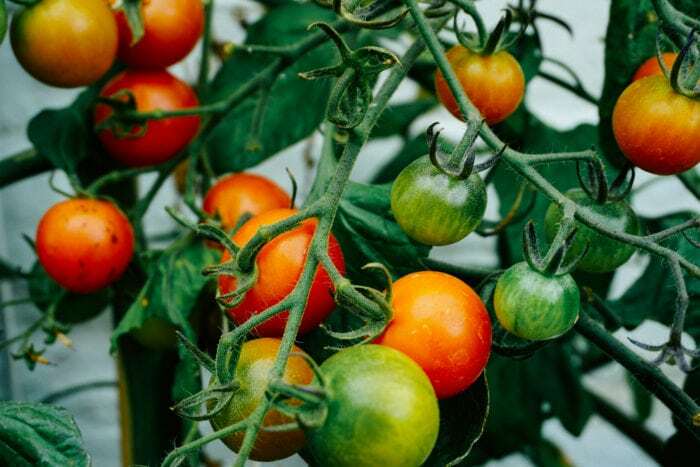 However, when the vines were heavy with ripe tomatoes and we added them to our plate I was hooked on veggies forever. There is nothing in this world like a sun-ripened tomato paired with crispy cucumbers next to a savory crisp fried pork chop and a scoop of mashed potatoes. Lordy, that was truly one of the best meals of my childhood. In a large bowl, whisk together the vinegar, olive oil and sugar. Toss in the cucumbers, tomatoes, onion and, and season with salt and pepper. Let marinate at room temperature for 15 minutes before serving. Tip: If you have younger children who feel strongly about onions in their salads then leave it out and just add the onion portion to your plate. But please keep encouraging trying it with the “PURPLE onion”, one day they will come around. If you love this recipe try our Spicey Funeral Potatoes, a real crowd pleaser! n a large bowl, whisk together the vinegar, olive oil and sugar. Sign up for email updates and gain access to our free printables. Subscribe to our mailing list to grab the update on the new Create and Celebrate Event, plus gain access to our Free Printable Library! I plan on making this soon. It sounds delicious. I made it just for my picky eater! lol. You can add more vinegar or a splash of lemon juice for more kick. Tasty healthy salad on the table at your house. Your photography makes me want to pull up a chair ath the table. Had the salad tonight with our insta pot ham and beans with Famous Daves cornbread. 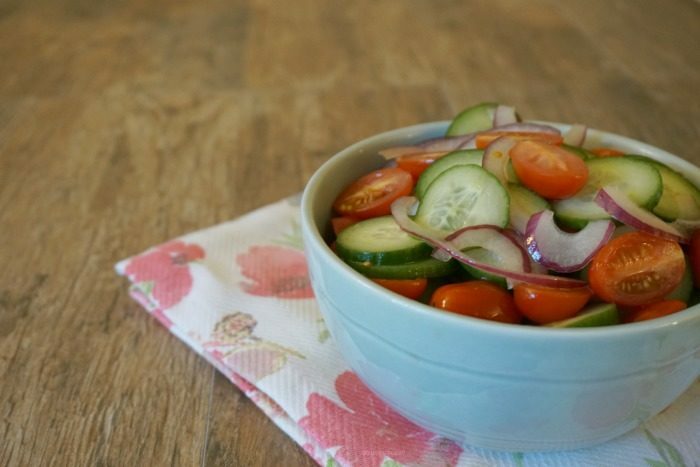 I didn’t expect my husband to care much for it but without even asking, he offered this vegetable salad is pretty good and probably pretty healthy! Thanks for sharing! Your recipe is reminding meof my childhood… fresh tomatoes- straight from the garden are the best. I used to love to go pick them and then watch my mom use them for dinner. I can’t wait to try this- I love an easy, great side.